On the healthy path since the beginning of the year? Good on you! 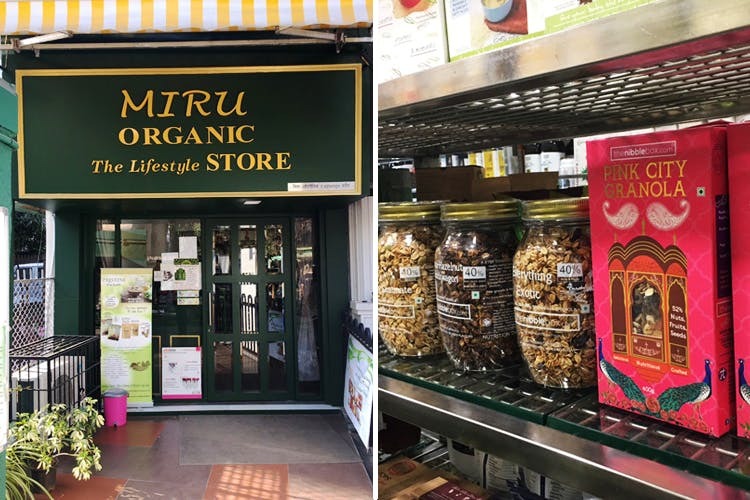 A health store in Andheri, Miru’s Organic Foodstore and Supermarket will sort out all your ‘ugh, I have to go all the way to Bandra again’ problems. Organic food has grown in popularity in the past few years, especially in a health-conscious and forward city like Mumbai. It is believed that organically grown foods are healthier and ergo, more nutritious due to far fewer, if negligible pesticide content in them. In spite of that, the ready availability of organic foods in physical supermarts remains limited. A year-old-store in Andheri, Miru’s Organic Foodstore is one of the exceptions to that statement. In the green Seven Bungalows area, this is a small supermarket wholly dedicated to all things organic, from pin to plane. You’ll find the organically grown alternatives for all your grocery items – masala powders, gluten-free flour, spices, granola bars, snack items, and a lot more. They keep a variety of brands, including Conscious Food, Seeds by Conscious Food, Trail mixes and different berries from Rostaa, organic honey from farms in Maharashtra, bread from Moshe’s and chocolate bars from Earth Loaf. These do come at a higher price than inorganic food, but supposedly with more benefits in the longer run. If you’re all about the organic life, then this store will help you a lot with your daily needs. Just getting introduced to it? Start small, the staff at the store will help you out.